The Jewish community in this former county seat was founded by immigrants from Moravia. They established their communal presence outside the walls, in a neighborhood that is now fully merged with the old town center. The Jewish community grew from 81 in 1727 to 989 in 1869, when the Jews represented one quarter of the total city population. After the Budapest Congress of 1868-1869, which formally split Hungarian Jewry, the Jews in Trenčín opted for an independent Status Quo Ante community orientation. There were 1,619 Jewish residents in the city in 1940, but only 326 Jews survived the Holocaust. The tiny community today has about a dozen members; it maintains a small prayer room in the former synagogue complex, and also a cemetery, located on Partizánska Street. 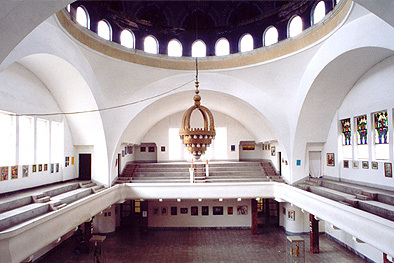 The synagogue, constructed in 1913, was designed by the architect Richard Scheibner from Berlin. The building represents a trend towards minimizing exterior decoration while preserving monumental classical forms: it is a mélange of Byzantine and Art Nouveau styles and modern concrete dome construction. The sanctuary is a large hall, which, as can be seen from old photographs, was once colorfully decorated. Today, only some fragments, including the stained glass windows, blue dome decoration and the chandelier are preserved. In the back part of the building, a small prayer hall, with a Holocaust memorial plaque listing the victims from Trenčín, serves as an occasional assembly place for the tiny local Jewish community.